I present here a short overview of the strange landscape alternately known as the Parking Meter Zoo and the Parking Meter Wasteland. 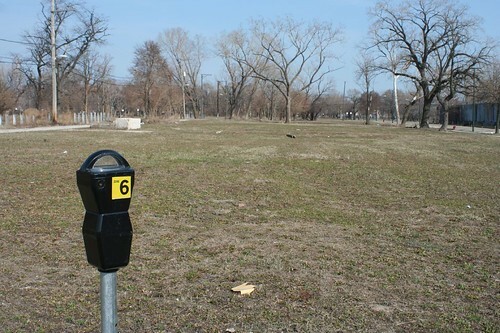 Though Chicago blog The Expired Meter has already done a fantastic job documenting this surreal story, I have to get my own two bits in, if only to post a few of the unearthly images that have resulted from this strange landscape. 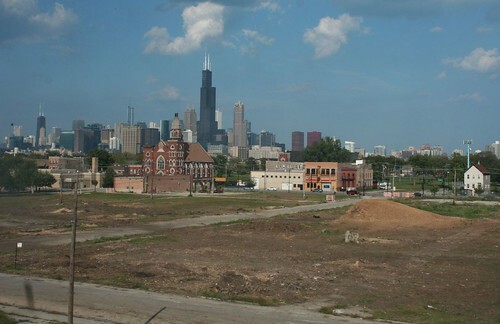 The area in question is on the lower near west side – just north of the Pilsen rail yard embankment, just west of Ashland – in an area adjoining the Illinois Medical District. 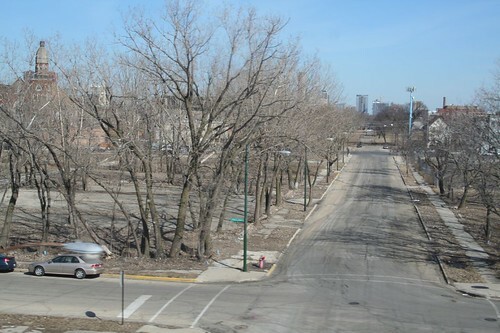 These utterly empty streets, an urban prairie including Wood Street, Paulina, 13th Street and 14th Street, were a popular parking spot for medical center employees. Well, you can’t have people parking for free, can you?! 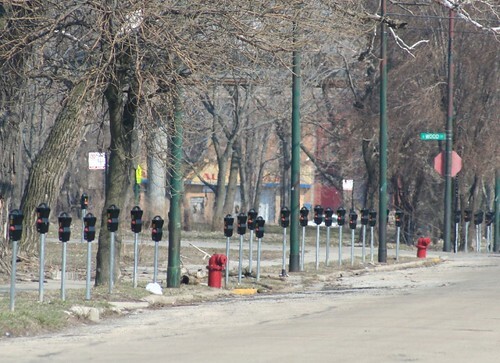 Fortunately, the local alderman rode to the rescue, having the city install 1200 parking meters on completely empty streets. “Problem” solved – nobody parks there anymore! Now, don’t get me wrong. I’m no advocate for free or cheap parking. “Free” parking is one of the great lies of American development, and a principal generator of sprawl. Parking requires land, infrastructure and maintenance, all of which have economic value – and so you always pay for parking somehow, whether through higher retail costs or higher taxes. “Free” parking is one of those tricky sleights-of-hand that American corporatocracy is so good at – an illusion that helps to diffuse and hide the true costs of the automobile, and thus enables all the attendant damage that has been done to American cities over the decades. But – the point of a parking meter is to keep traffic moving throughout the day, so that shoppers and people on business can reach local stores and businesses. It’s so people don’t just plonk their car down all day in a spot that other people need to use. I’m gonna go out on a limb and speculate that this site does not face that kind of competition. Now what’s this? Where’d the meters go?! Why, they took the thousands of brand-new meters out again… to replace them with the new meter boxes! But of course, even that may not last, since they’re dropping a new CostCo grocery store on part of the site, whose description includes all the vacant land shown here. I seriously doubt Costco will build without a sizable parking lot, and I will be surprised if they don’t want to take out at least part of one street. I mean, are they high or what?? By way of history – these empty blocks were chock full of houses (and one large industrial building) a hundred years ago. The near West Side had a rough reputation when the Illinois Medical District was founded in 1941; by the 1960s, eminent domain was being used to gobble up properties in the area. Today, only a few faint foundations remnants and porch stairs remain to indicate that a neighborhood once stood here. The movie "Primal Fear" with Richard Gere and Edward Norton uses the story of the Lower West Side neighborhood destruction as a partial backdrop to main plotline. 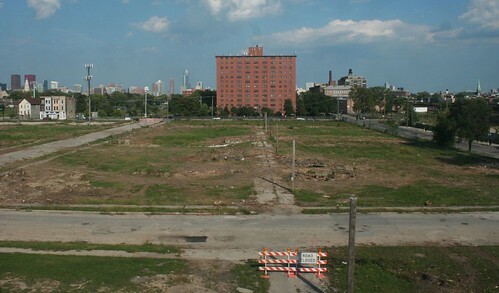 i just took the pink line to pilsen last month and made sure i examined the area from the train. i didn't realize the surreal neighborhood was populated with parking meters. strange indeed. keep up the good work. still following the blog all these years from MKE. 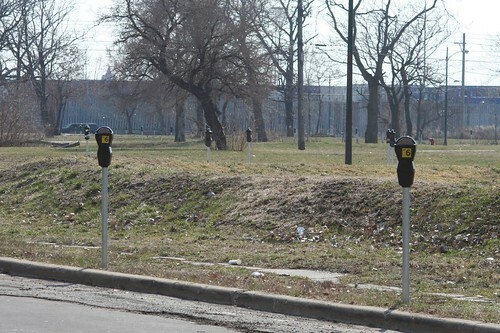 I just moved a few blocks away from this parking meter grave yard, and it is certainly a sight to see and a waste of money. The reason why these meters aren't making any money is because people can not leave work to pay the meter again. These meters are never used and are nothing more than a nuisance. 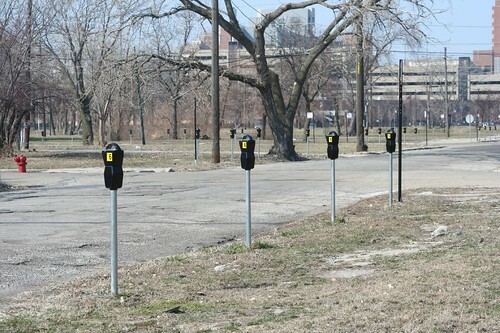 There's a stretch of South Federal that's similarly ridiculous – no buildings, but there are parking pay boxes. I have NEVER seen a car parked there.